The honour roll commemorates 544 members of the 42nd Battalion who died in service or were killed in action during World War One. 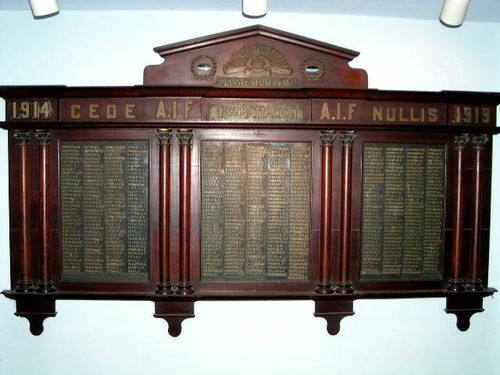 The memorial roll of honour was unveiled by the Governor of Queensland, Sir Leslie Wilson in the Crypt on the 18th August 1935. The Courier-Mail (Brisbane), 19th August 1935. The 42nd Battalion was raised at Enoggera, on the outskirts of Brisbane, in December 1915 and became part of the 11th Brigade of the 3rd Australian Division. Due to sharing its numeric title with the famous Scottish regiment the Black Watch, the battalion became known as the “Australian Black Watch”. This association was recognised with a bagpipe band.